I’ve previously written about how we need to move away from our dependency on our energy suppliers, and in turn, the use of fossil fuels (which continue to make up the majority of energy generation, averaged out over all tariffs), along with some easy starting points in achieving this. The need to move away from fossil fuels has never been greater, as we continue to move closer to runaway climate change, and significant irreversible effects on our planet. Arguably, we have already succeeded in this, as the greatest mass-extinction of species on Earth, since the extinction of the dinosaurs 65 million years ago, is well underway. This is the 6th mass-extinction event the world has experienced, but for the first time, it is caused by just one species; humans. But, can it be done? Is it possible to move away from the need to burn fossil fuels, but still be able to generate the energy we require to continue to enjoy the lifestyle to which we’ve become accustomed? 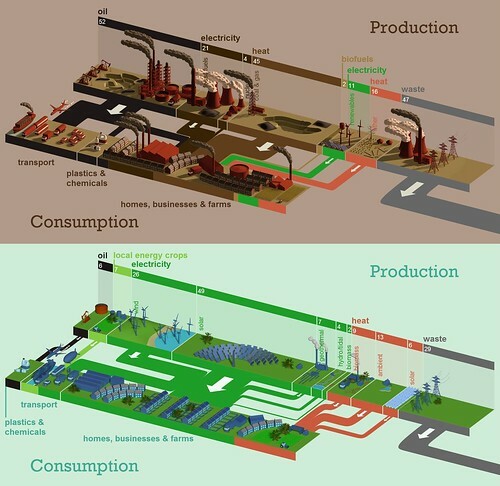 Today sees the launch of a groundbreaking new web resource from UK Tar Sands Network, which brings to life two possible models of energy production and consumption for the year 2035. The first, ‘Fossil-Fueled Future’, is the future the International Energy Agency forecasts we are heading for if governments and fossil fuel companies follow through on their current promises on energy and climate change. This future is not the worst-case scenario: it’s the best that politicians and businesses are currently offering us. In this world, global temperatures will rise by at least 4–6°C this century, resulting in inevitable runaway climate change. The second ‘Cleaner Fairer Future’ draws on extensive research including the latest Zero Carbon Britain report by the Centre for Alternative Technology (released just last week). It shows that currently available renewable energy technologies can meet the energy needs of our growing global population in an equal and environmentally sensitive way. In this world, there is a decent chance of avoiding runaway climate change. The health outcomes for the planet, humans and all other life are markedly better.